The Academy of Contemporary Music (ACM) would like to congratulate the ACM Gospel Choir on their latest achievement, a Guinness World Record! The ACM Gospel Choir flew straight into the records book after performing the World’s highest ever gig. At 32,800ft, on an easyjet flight to Geneva, the choir staged the highest altitude carol concert – encouraging the entire plane to join in the fun and help set the record as part of a two month fundraising initiative between easyjet and UNICEF. 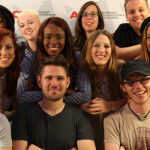 The ACM Gospel Choir was formed in 2005 at the Academy of Contemporary Music by vocal coach Mark De-Lisser. The choir rose to fame when they reached the semi-finals of BBC One’s Last Choir Standing series in 2008. Dubbed the youngest, hippest choir and the “Stars” of the show they have gone on to tour with Russell Watson, perform with Beverley Knight, JLS, Diversity, Alexandra Burke, record with Robbie Williams, Scouting For Girls, Olly Murs and sung as special guests for HRH The Queen on numerous occasions. Click here to find out more about the ACM Gospel Choir. Make sure to follow them on Twitter too!